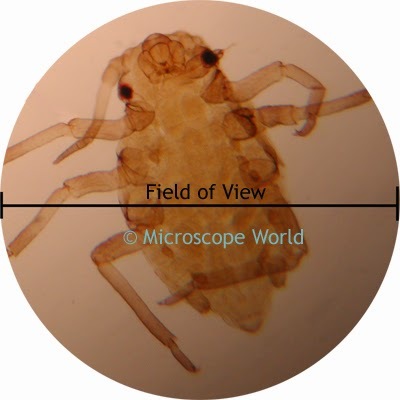 The microscope field of view, or field diameter, is the distance across the image as seen through the microscope. The field of view is greater at lower magnifications. For example, at 10x magnification 20mm might fill your field of view, whereas at 40x magnification you might only see 5mm. Calculating field of view is a simple mathematical formula. 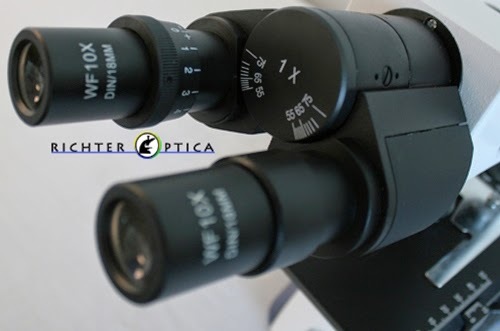 You will need to know the field number of the eyepieces being used, the objective value, and any auxilary objective values. Notice the field number written on the eyepieces says 18mm. If you are using a stereo microscope with a 0.5x auxiliary lens on it, you would first need to look at the eyepiece to see what the Field Number (FN) is. If you were using 10x eyepieces and the field number was 20, and you wanted to find the field of view at 30x magnification, do you know what the math equation would look like? At 30x magnification the entire field of view in the microscope setup mentioned above is 6.67mm.